Patients have been carrying their medical images from imaging facilities to referring physicians for about as long as medical imaging technology has existed. As it has in many other ways, the digital revolution has put a new spin on an old practice. Patients still carry images between healthcare providers, but burning CDs for patients offers advantages, including portability, greater storage capacity, and lower cost. However, CDs also require new protocols, including how and when to import digital images into your facility’s PACS. Defining those protocols can be a challenge. Although viewing a CD seems like a simple matter, multiply that CD by hundreds or thousands of patients and the challenge becomes more complex. Depending on an imaging facility’s volume and the role it performs in its community, a facility needs to consider many factors before settling on a policy. Hospitals that specialize in cancer treatment have different needs from large trauma centers or small community hospitals. Fundamentally, a facility has to determine whether it has the resources and technological capability to accept patient CDs. Once the decision has been made to accept CDs, imaging facilities need to find an efficient way to get the images from the CD to the radiologist. In some facilities, technologists load the studies. In others, someone in the film library or a designated CD clerk does it. Some facilities load the images into PACS; others have special laptops for this purpose. Whichever method a facility chooses, it’s important to load and track the CDs in a consistent manner. It’s also important to verify that a CD is labeled correctly because, according to some estimates, as many as 1% of CDs may be mislabeled annually. But having a physical process for CDs is just the beginning. Davis says it’s important for hospital and imaging center managers to work with their radiologists to determine the clinical needs for CD images. A trauma center may be getting more CDs that haven’t been interpreted, while a cancer center may be getting CDs that were interpreted a year or two earlier. In many cases, the CDs that come in are for comparison purposes. Facilities that perform a lot of mammography rely heavily on prior studies. A CD’s purpose influences how it needs to be processed. Clinical needs should guide receiving and processing procedures, but there is a technological component as well. CDs can contain a great deal of information, but putting that information in a readable format can be difficult. Radiology must work closely with the IT department to ensure that the process succeeds. “A lot of the CDs that come through are in a format that is either unreadable or provides some sort of barrier to the radiologist or the surgeon who is trying to look at the images,” says Chris Meenan, director of clinical information services for the radiology department at the University of Maryland Medical System. Meenan says adherence to standards is the biggest challenge to CD readability. Many CDs don’t comply with Integrating the Healthcare Enterprise data profiles. They often have various levels of compression; some aren’t even in DICOM format; others launch their own viewers, which may or may not be compatible with a facility’s computer systems. All these issues can cause downtime. And then there are viruses and malware to consider. Despite the challenges of loading and reading images, the extra effort can provide radiologists with information that improves patient care. Radiologists want to see prior imaging data whenever possible to help spot irregularities. Also, quality comparison images reduce the need for repeat imaging. To Archive or Not to Archive? Although the percentage of prior studies coming to the University of Maryland from other facilities is small, it is increasing. Patients more frequently request CDs to take to other institutions, and there is a greater demand from clinicians for prior studies. Overall, CDs are becoming a bigger part of patient care. While more information is often good, it can become too much of a good thing if policies aren’t in place to manage it effectively. Maryland’s film library has begun asking surgeons to choose relevant studies whenever possible. In cases where a surgeon thinks he or she might need all available information, the film library provides it but asks clinicians to think about what they really need in an effort to maximize storage space and manpower. Patient demand has increased the library’s workload as well. The storage issue is also important. Aside from CD requests, if new imaging shows an interval change, the facility must consider whether to archive the comparison images. Determining which data need to be saved long term and which data only need to be stored temporarily can be tricky. What that leads to is a discussion of what the facility is obligated to archive. “If the radiologist sees a particular indication and makes a recommendation based upon a CD that may leave his or her possession right away, the question is should we have that data as supporting documentation in regards to why a particular path was chosen,” says Meenan. Depending on the circumstances, a radiologist may issue a report based on the prior images, which will also affect the decision regarding how long to store it. Those circumstances among institutions based on the policies that are in place and whether the institution allows the radiologist to read a study on his or her own or requires a formal request for interpretation. An important consideration is the age of the study; a study that was done a couple years before may warrant a reinterpretation compared with a recent study. Another important consideration is the quality of the study. There are also privacy issues to work out. How should facilities safeguard CDs? They have to decide whether to store them in file rooms, return them to the patients or the institutions that they came from, or destroy them. In addition, there are HIPAA requirements for studies that are done internally, but those requirements are less clear as they relate to outside studies. Facilities need to decide how stringent their auditing process will be for monitoring who has access to outside CDs, who has seen them, and where they are. 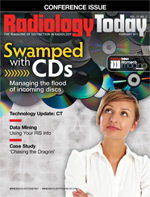 Even as facilities adjust to the increasing use of CDs, many in the radiology community see them as a transitional step between film and direct digital transfer between facilities. There are already plans in the works to move beyond physical media and transfer images directly between institutions. The Mayo Clinic; Mount Sinai Medical Center in New York; the University of California, San Francisco; the University of Chicago; and the University of Maryland are participating in a joint RSNA-National Institute of Biomedical Imaging and Bioengineering pilot project “to build a secure, patient-centric medical imaging sharing network that is based on open source principles and open standards architecture.” The project will not only allow the direct transfer of medical images between institutions; it will allow patients to control access to their information through PHR accounts. In the meantime, facilities will need to have sound CD policies in place to keep their operations running smoothly.